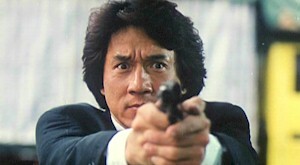 The Skinny: Good cop thriller that stars some guy named Jackie Chan. Chan's serious acting is decent, and the film's execution is effective. The last hurdle: can you take the film seriously? This film asks the question: are serious films with Jackie Chan-type action possible? Or, can Jackie Chan be believable in a serious film? Apparently, Chan would like you to think "yes", because he made this serious cop potboiler from King of Cop Potboilers Kirk Wong. Chan plays Eddie Chan, a brilliant but troubled cop who fights police corruption while embroiled in a kidnapping case. He's partnered with Kent Cheng, and the two hightail it to Taiwan to capture the kidnappers. However, it looks like Kent may be a double agent, which leads inevitably to...a prop-fillled action sequence! As a cop film, Crime Story delivers. It features the usual doses of heavy cop angst and a ripped-from-the-headlines story (it's based on a true kidnapping case). Kirk Wong handles all the angst and the action fine, but when the occasional acrobatic Chan moment occurs, the whole film seems to stand still. Seeing him run up a wall in the middle of an intense interrogation sequence just seems wrong. Crime Story isn't a comic book movie, but Jackie Chan's occasional crazy action belongs in a comic book movie. The result: a good movie with inappropriate action sprinkled throughout. Sure, it's fun, but is it right? Notes:  Acquired by Miramax/Disney and released in the United States on home video. As per their usual modus operandi, the film was cut, though the original music score remains.